Peter Blamey is a Sydney-based artist who has been doing performances and making works for quite a while now, and looks like continuing to do so for the foreseeable future. His practice largely revolves around what might be called ‘open electronics’ and explores connectivity, variability and re-use, and also ideas of electricity, history, ecology and experimentalism in a more general sense. 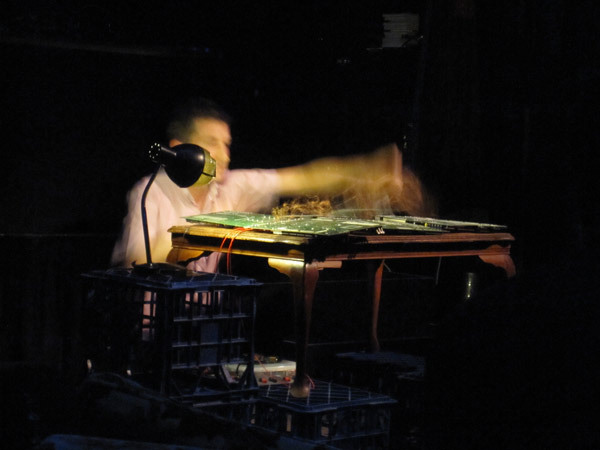 Much of Peter’s current work re-deploys commonplace electronic components in novel combinations to produce sounds in performance and as readymade materials for installation projects. He has a background in experimental music and has been fortunate enough to have performed at experimental music and electronic arts festivals around Australia, includingWhat is Music?, Liquid Architecture, Electrofringe, and The NOWnow festival, along with innumerable other gigs. Peter has collaborated and performed with a range of local and international artists, including Jim Denley, Adam Süssmann, Emily Morandini, Joel Stern, Clare Cooper, Anthony Guerra, Rosalind Hall, Philip Samartzis, Kusum Normoyle (in the duo Hard Hat), Oren Ambarchi, Amanda Stewart, Dale Gorfinkel, Toshimaru Nakamura, Brendan Walls, Sean Baxter, Laura Altman and Matthew Earle. Peter also researches and writes about sound, both in the arts and in general. He was once a director of Pelt gallery in Sydney, plays drums in Your Intestines and also in Desert Luck, and that’s about it.